Sky Man International, a Belgium company with 20 years of experience in the suspended powered access business, is very active in the market of service cage wind turbine tower hoists. These hoists are ladder- or pre-tensioned wire rope guided access & service cages for maintenance, inspection and repair purposes inside wind turbines and other tower applications. The Sky Man hoists use a state of the art hoist principle, based on a polymer compound pressure ring. Although this makes it a very steel wire rope friendly design, the performance of this concept at extreme temperatures needs to be validated. In turbines located in artic regions, extreme temperatures of -55°C to -60°C can occur during winter time. On the other hand, wind turbines located in hot regions (i.e. deserts in India, Africa, China,…) can suffer from extreme heat with temperatures up to +58°C maximum. OWI-Lab is an open and independent testing facility, created to accommodate this kind of testing. 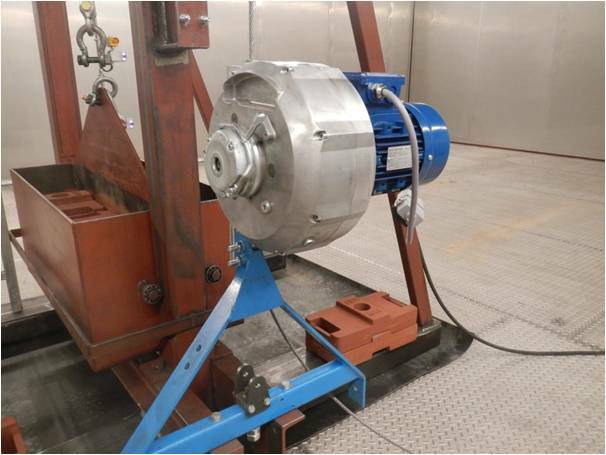 The climatic test chamber with 8m of free height and temperature testing ability ranging from -60°C to +60°C, ensures that all required temperature validation tests can be performed by the use of a special hoist test setup mounted inside the test chamber. After the desired testing temperature is reached, the performance can be thoroughly tested and monitored. In this way Sky Man International gains a lot of knowledge in the systems behavior at extreme temperatures and can guarantee stable, reliable and safe performance at any extreme temperatures.